Our bodies are incredible they can do the impossible. As I walk I have been observing men and women ages 15-70 use a tumpline (see definition below) to carry 60-90 lbs over and up steep, rocky, uneven, terrain for miles. Many pass me with a smile saying " Namaste." (the Nepalese greeting) One lady, who looked to be in her late 60's, was carrying a stack of 6 pieces of lumber 10' long. As we were passing she saw my camera, stopped, looked at me and said, "photo", requesting that I take her photo. I was surprised and delighted. So as she continue to stand with the weight on her head I repositioned her so she wasn't shaded, focused my camera and captured a few close ups. Then I showed the photos to her. She smiled, exposing her yellowed teeth and bright red swollen gums. I thanked her and we went on our way. 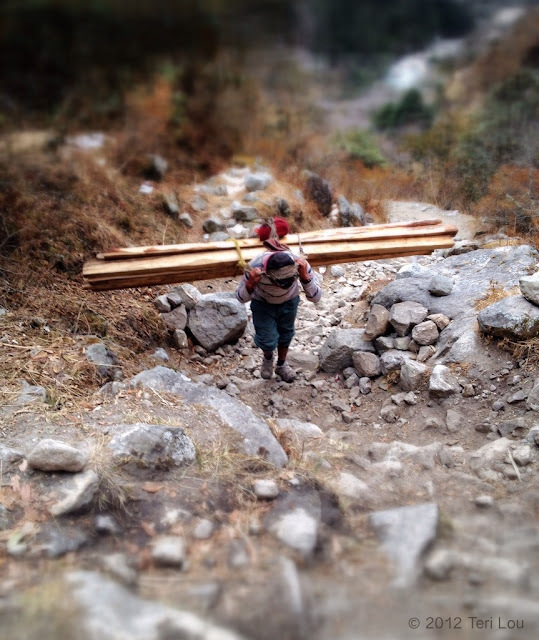 It fascinates me that the Nepalese can walk for miles each day back and forth moving lumber up the mountain for a small wage. The man in the photo carried the lumber all the way up from the valley. I am amazed when watching him maneuver the long pieces round the trees and rocks. He only stops a few times along his journey when he can balance his load on some rocks. As I walk I find my steps difficult because of the loose rock and I am wearing sturdy hiking boots. I can't believe that these strong tough workers sometimes are wearing only flip flops, especially in the bitter cold. /tump-lyne/ A tumpline is a strap attached at both ends to a sack, backpack, or other luggage and used to carry the object by placing the strap over the top of the head. This utilizes the spine rather than the shoulders as standard backpack straps do. Tumplines are not intended to be worn over the forehead, but rather the top of the head just back from the hairline, pulling straight down in alignment with the spine. The bearer then leans forward, allowing the back to help support the load. Tumplines are often used to transport heavy loads across uneven terrain such as footpaths and portages. The voyageurs of the North American fur trade used tumplines exclusively to carry their cargo of pelts and rations across portages. Backpacks for the military and recreational campers were redesigned to carry larger loads during the middle and late twentieth century, and tumplines have become less common in the developed world. Oh my! I tried backpacking once with 50 pounds in my backpack, where over 10 pounds of it was camera gear and I found the weight crushing! I was suer glad to get that pack off! I don't even know how they carry these heavy loads!